When you’ve been working out for a while and you know most of the exercises in the book, it can become challenging to create a routine that tests your body in new ways. If you’re ready to mix things up, then here’s six dumbbell exercises to spice up your arm routine. Although the exercises below are simple, the way they are performed, can make all the difference in creating a workout that works. When you want to isolate specific muscle groups in the arms, using dumbbells is truly effective — get ready to feel the burn! 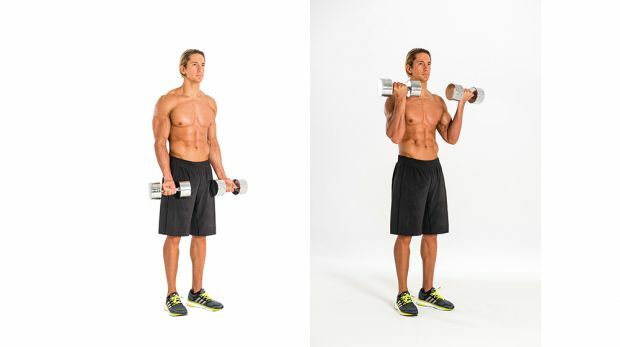 Stand with dumbbells by your sides and palms facing forwards. Keeping your elbows tucked in to your sides, curl the weights up, squeezing your biceps at the top. Why: It’s the classic biceps lift for good reason: performing this move perfectly is one of the fastest ways to add size to your biceps. Just keep your reps controlled to avoid swinging the dumbbells up and down.